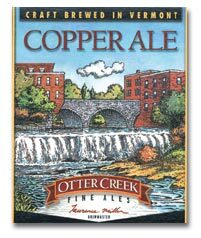 The Copper Ale pours a medium amber color with a white head. Fair lacing over a clear body. Aroma's of toasted/roasted malts and perfume hops, as well as soap and apple. Initial flavor is light bitter with a sweet finish that lasts and lasts. Light and oily on the palate with fizzy carbonation. Metallic feel left over. Bottled on 10/4/05. Reviewed on February 27th, 2006 with Wood, Lisa "Left Hand" Griffin, Thirsty Beard, and MB.